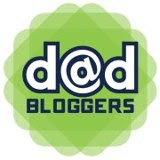 Cleanup in Aisle Seven | Daddy's in Charge? 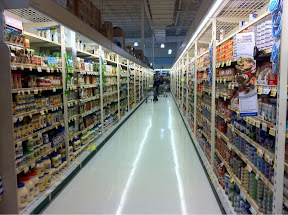 There is nothing I hate more than going to the grocery store. It always seems you spend over a hundred dollars and all you walk out with is a new bottle of ketchup. I hear they actually have food that you can eat but it only seems like I freeze everything that I just bought, and yet I never thaw anything out. If it doesn't end up in the freezer it goes in the pantry, never to be heard from again. I looked in there the other day and I had 35 boxes of pasta, 17 cans of tuna fish, and half a box of bran flakes. What actually am I buying and where does it all go? I have no idea, but you can't live off boxed macaroni and cheese as much as my boys would tell you otherwise. I hate the little grocery store games you have to play. It's harder to find a melon than it is to find the Loch Ness Monster. Some people shake them, tap them, or toss them in the air. I, not wanting to feel left out, do a combination of the three. 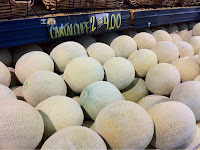 I have no idea how that tells someone that a melon is ripe, but if everyone is doing then it must tell you something. Then you've got the eggs. How many cartons do I have to go through before I can find an actual dozen. It seems like they are all broken or missing an egg. Someone really needs to be in charge of these throughout the course of the day. My brother-in-law once came to our house with what was supposed to be a dozen eggs, only to find out two were missing and three were broken. Of course there is always the coupon thing, I have the time to do it but have ZERO desire to do so. I once saved $45 with coupons but I don't know how much I actually spent in getting them. It felt like quite an accomplishment at the time, but I am not sure it's one I could replicate every week. Then there is the shopping cart thing I won't get into as to not offend any more women. In order to make the shopping experience more enjoyable however, I bring my kids whenever I have the chance. 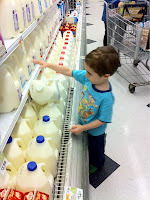 For some reason they enjoy it much more than I do, and there is something about seeing Carter trying to lift a gallon of milk that puts a smile on my face. I know a lot of people can't get anything accomplished with the kids in tow, but I have never had that problem. Maybe since I have been taking them with me wherever I go, they have gotten used to it. 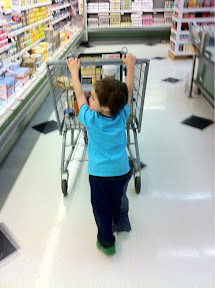 It's alway good to have someone push the shopping cart so I can focus on what I need to get. Of course we do end up getting a few more things than we normally would, but that's OK. Just having the boys along is worth the extra money spent on candy bars and cigarettes chips.